And zucchini bread is what I made, but dressed up in Indian ishtyle! Zucchini or Courgette is something I was introduced to after coming here. First time I bought it from Farmer’s market thinking it was Cucumber only to realise later it being a vegetable from a family of gourds. Although in culinary context it is treated as vegetable and cooked in savoury dishes, it is in fact an immature fruit being the swollen ovary of the female zucchini flower. It is called as Courgette (diminutive of courge, French for squash) here in UK, France and Ireland. It being a water-based vegetable, I often use them in Dals or simply grilled with other vegetables and served with Guacamole, a safe bet me thinks. 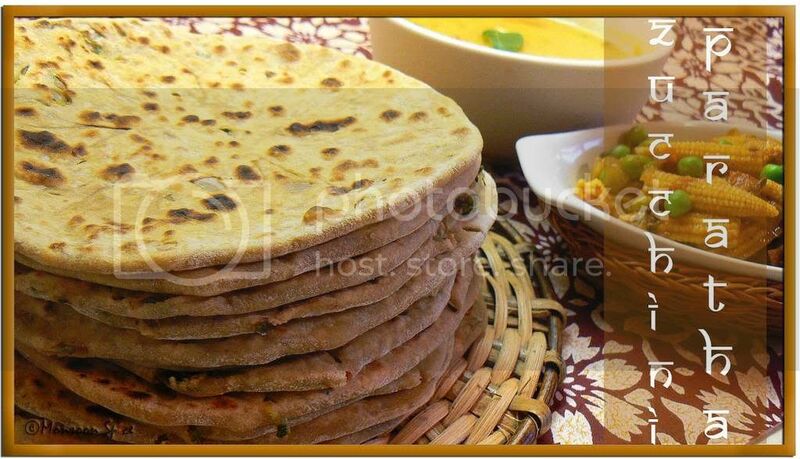 This time around I wanted to try it in a different way and used it in making stuffed Parathas. My obsession with stuffing the Paratha is not diminished even a bit since I made those Aloo Parathas. With no potatoes (can you believe that??? No potatoes in my pantry for one whole day), cauliflower or radish in my well stocked refrigerator and pantry, I just thought of giving up making parathas in the end. Then my eyes fell on modest Miss. Slender, Courgette, I bought from farmer’s market. She was sitting there looking not that happy. May be the male counterparts were giving her hard time. I stared at her, she stared back-neither of us blinking for long. She seemed to be pleading to take her away from cold shelf and all male attention she was getting. Well, it looked like it was just Miss. Blush-y Cheeks, Tomato, who enjoyed all male attention. I decided to take away all her misery by using her in stuffing the Parathas. She happily obliged and transformed herself from almost-tasteless self to savoury delight. She beautifully blended with other ingredients and turned herself into a perfect treat for our weekend meal. 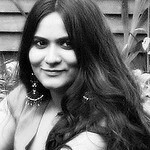 This stuffed Zucchini Paratha is my entry for Valli’s Roti Mela and Archana’s One D events. Ladies I hope you like my entry. Add salt to grated zucchini/courgette and keep it covered for about 10 mins. Take handful of courgette at a time and squeeze out the water (which can be used while kneading the dough) as much as possible. They should be as dry as possible or else the moisture content will make it difficult when rolling the stuffed paratha. Mix in chopped onion, chillies, dry mango powder, garam masala, chopped garlic, and roasted jeera powder and keep it aside. Slowly add the squeezed water from zucchini/courgette and warm water as and when required and make stiff dough. Place about 1 tbsp of filling in the centre. Cover and seal the ends and roll again, dusting flour if necessary, into ½ cm thick roties using rolling pin. Gently dust off the excess flour and place Stuffed Paratha on griddle and cook on both the sides till its cooked and brown spots start to appear on top. Apply little ghee/oil if desired. Serve hot Zucchini/Courgettes Parathas immediately with any curry or with plain yogurt and pickle of your choice and enjoy. Squeeze out as much of water as possible from courgette/zucchini to avoid from getting soggy parathas. If the water is not squeezed well then there is high chances of it getting difficult to roll them with out the stuffing oozing from the dough and breaking them. 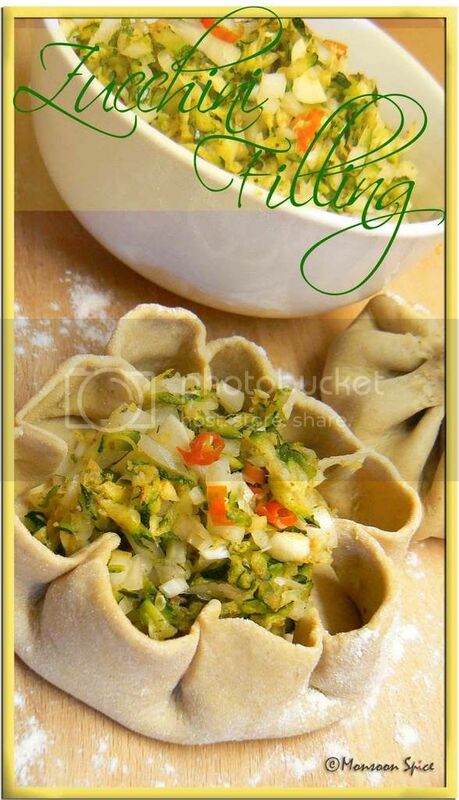 If you are a beginner, start with small amount of stuffing/filling and roll into parathas. Once you learn the technique and are comfortable with the process, you can gradually increase the amount of filling. Many thanks to dear JZ (Good Chat Blog Award), Alka (Rocking Girl Award and Inspiration Award) and Vandana (You Make My Day Award) for passing me these awards. Thank you ladies. Sia thats a nice try with Zuchini.we hardly get it here the fresh one and if we get it also its very expensive. I have tried it only in salads so far. but this sounds good. Sups..how strange that we both must be talking in the same lines on our post today!..heheh..paratha looks yummy..and I am glad you took notice of Ms. Slender!... :D..thanks for the entry..I simply love it! I have a huge smile reading about you slender zuchinni. Trisha got perm driving L this morning, so happy to realize I don't need to go everywhere with her! Phew! One down and one more to go! Hahaha! Parathas look yummo. I love Zucchini, not watery like Cucumber, holds well. Got Mosaranna at Aroma! He he Sia, if u make a feminine cooking "Ms courgette parotha " who will dislike it :) Looks splendid ur twist! 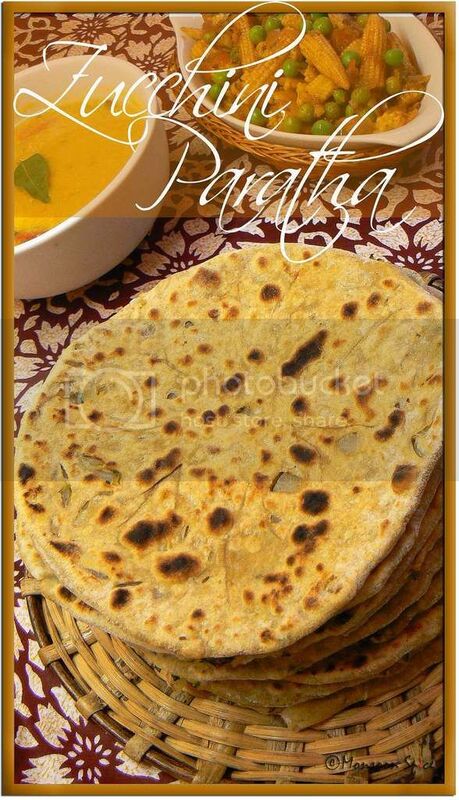 delicious parathas. congrats on the awards. Yes, zucchini makes an amazing filling for paranthas! Totally yummy, isn't it. And i am eyeing the baby-corn sabzi as well (looks a total yummo-fest!). nice paratha with zuchini..love the pictures..
Last day etnry to MBP... deal? It is all set... will auto publish on the deadline date. Never thought to put zucchini in a paratha. Nice idea. But then that's the thing about how you can make parathas from a variety of vegetables. You can start your own paratha mela :) So many varieties, tho' I admit I raised my eyebrows reading courgette parathas!! Another nice way to use Koosa!! 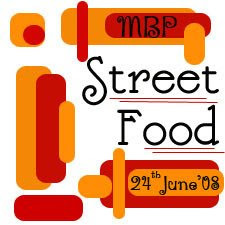 sia, the pics are just just beautiful..it really makes us visitors crave that food :-)great job on ur creativity!! delicious stack of parathas sia..even i made zucchini parathas ones..came out good. :)..beautiful pics too..congrats on ur awards.. Simply loved the pictures. Making me hungry. Wow ,what a title,what a recipe and what a presentation.....just perfect! Hi Sia, how are you? Just yesterday, my friend called me from another city to ask what courgettes are, and I said zucchini and she wasn't familiar with it, so we had a good laugh over the names and their pronounciation. Yesterday, I was re-reading the conversation we had last year about 'devil's dung' - good fun!